Arborizing blood vessels, Bcc, Basal cell carcinoma Arborizing blood vessels – cite! Arborizing blood vessels (message) Arborizing blood vessels – participate! 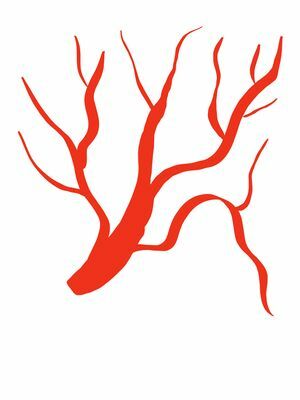 Arborizing vesselsanalytic term is branched vessels; Bright red sharply in focus large or thick diameter vessels dividing into smaller vessels; BCC appear under dermoscopyThe examination of [skin lesions] with a 'dermatoscope'. This traditionally consists of a magnifier (typically x10), a non-polarised light source, a transparent plate and a liquid medium between the instrument and the skin, and allows inspection of skin lesions unobstructed by skin surface reflections. Modern dermatoscopes dispense with the use of liquid medium and instead use polarised light to cancel out skin surface reflections. as bright red, thick diameter vesselsThis glossary term has not yet been described. (0.2 mm or more) from which emanate branching vessels with progressively thinner diameters. These "tree-like vessels" are sharply in focus due to their superficialThis glossary term has not yet been described. location, situated slightly below the epidermis, and exhibit irregular branching into fine terminal capillaries of small diameter (10 μm). Arborizing vessels are present in more than 80% of basal cell carcinomas (BCCs), and were classically considered to yield a positive predictive value (PPV) of 94%, and sensitivityThis glossary term has not yet been described. and specificityThis glossary term has not yet been described. of 96.1% and 90.9%, respectively . However, In a recent study from korea, only 54% of the lesions that displayed arborizing vesselsanalytic term is branched vessels; Bright red sharply in focus large or thick diameter vessels dividing into smaller vessels; BCC were found to be BCCs . The difference in the PPV of arborizing vessels for the diagnosis of BCCAbbreviation for Basal Cell Carcinoma can be explained by the type of lesions that are included in each analysis. If an analysis includes only lesions that are in the differential diagnosis for BCC, the PPV of arborizing vessels may be higher than in an analysis that included all lesions, regardless of their differential diagnosis. This highlights the fact that dermoscopic features should be analyzed based on the contextThis glossary term has not yet been described. of the lesion on which they appear. Adnexal tumors can sometimes appear similar to BCCs and may display arborizing vessels. Although uncommon, arborizing vessels may be seen in benignis any condition that is harmless in the long run lesions, such as fibrous papules, intradermal neviThis glossary term has not yet been described., cysts and hypertrophic scars and keloids; however, in these lesions the vessels are usually not in sharp focus. In addition, arborizing vessels can, on rare occasions, be seen in invasive cancers, including melanomaThis glossary term has not yet been described. and Merkel cell carcinoma. There are several histologic variants of BCC, including nodularThis glossary term has not yet been described., superficial, and infiltrative. Each of these BCC subtypes can present as amelanotic lesions or they can present with pigment. BCCs that are amelanotic can be identified based on the presence of arborizing vessels, shiny white areasThis glossary term has not yet been described., crystalline structuresThis glossary term has not yet been described., and/or ulceration. 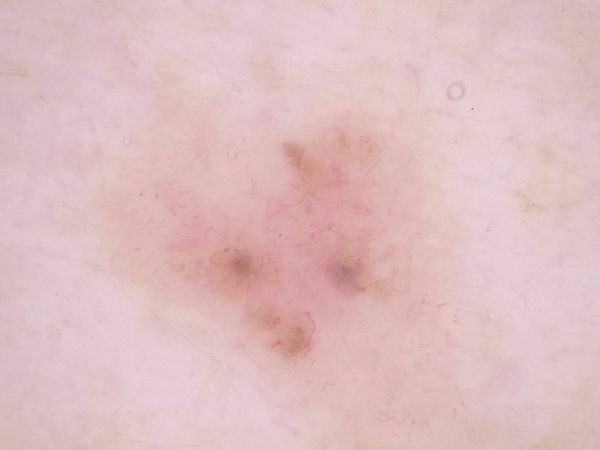 Pigmented BCCs (pBCC), which may clinically mimic melanoma, contain specific dermoscopic structuresThis glossary term has not yet been described. that aid in their proper diagnosis. Menzies model for dermoscopic diagnosis of pBCCs (sensitivity of 93% and specificity of 89–92%) includes arborizing vessels as an important diagnostic feature. Arborizing vessels were observed in 52% of pBCCs, compared with 23% of melanomas and only 8% of benign skin lesions . While arborizing vessels are often quite prominent in nodular BCC, they tend to be less conspicuous in superficial BCCs (sBCC) and in fibroepithelioma of Pinkus, a rare BCC subtype. In sBCC it is common to see short fine telangiectasias, which are sharply in focus and arranged irregularly throughout the lesion. Additional presence of shiny white-to-red areas and multiple small ulcer- ations or erosions can provide reassurance that the lesion under investigation is a superficial BCC. These fine arborizing vessels, which are described as smaller in diameter than typical arborizing vessels and with less branching, have also been noted in fibroepithelioma of Pinkus. In addition, Pinkus tumors are often accompanied by dotted vesselstiny pinpoint vessels at the lesion’s periphery. ↑ Kreusch &: Vascular patterns in skin tumors. Clin. Dermatol. 2002;20:248-54. PMID: 12074860. ↑ Jin et al. : Arborizing Vessels on Dermoscopy in Various Skin Diseases Other Than Basal Cell Carcinoma. Ann Dermatol 2017;29:288-294. PMID: 28566904. DOI. This page was last modified on 4 January 2019, at 16:27.